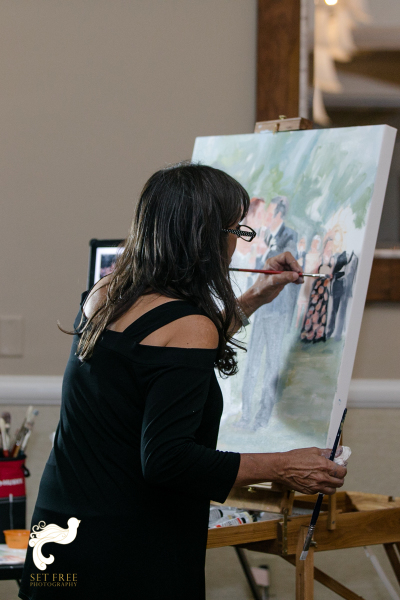 I create an oil painting of a special moment at your significant day that you will treasure for the rest of your life! Here is how it works. I arrive at the location of your event two hours before the celebration begins. Prior to the event, we will have discussed and agreed on what you would want me to capture for your oil painting. Now I start the painting - sensitive to the importance of the occasion and with 35 years of experience as an artist. I paint throughout the party. It is interesting for many of the guests, who will come back to see the progress of the painting from time to time. Warmly engaging with your guests adds to their pleasure and mine. By the end of the evening the oil painting is well on its way. The next stage is when your painting heads to my studio. I will work on it for a couple of weeks, until I am sure you will be thrilled with it. I will send you a digital image of the painting for final approval. Finally we will make arrangements regarding delivery to you of the precious memory of your wedding. ​​Please contact me if you are interested in finding out about commissioned paintings.